Killer Instinct for Xbox One and Windows PC will get a new fighter in January, Microsoft Studios and developer Iron Galaxy confirmed today. Kilgore, a cyborg who brings some major firepower to the fighting game, will join the roster next year. 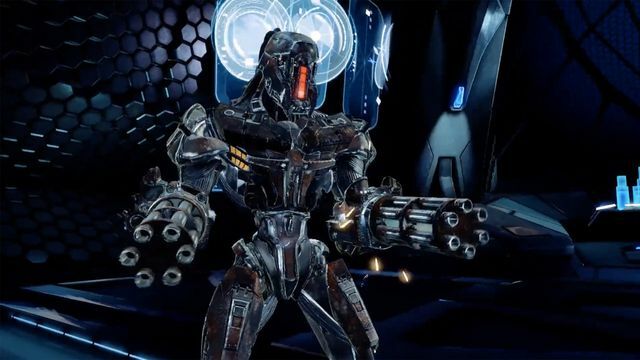 Kilgore will draw obvious comparisons to Killer Instinct series veteran Fulgore, though beyond the twin minigun arms, we don’t know too much about the new character’s capabilities. While Kilgore won’t drop until January, Killer Instinct players will get a sneak peek at the new addition soon, the developer says. Players will get to fight against Kilgore starting later this week. Microsoft Studios community manager Rukari Austin said on Twitter that Kilgore is an UltraTech-developed amalgamation. Some of Kilgore’s animations are borrowed from other Killer Instinct characters as part of a “re-imagining” of the cyborg fighter, Austin said. This week, Killer Instinct players will also get a new costume for Thunder, for free, as part of the game’s version 3.6 update. According to Austin, Thunder’s new costume was created by “working closely with the Nez Perce tribe,” an indigenous people in the Pacific Northwest, to bring an “authentic warrior outfit” to Thunder. In the modern version of Killer Instinct, Thunder is a traditional Native American Nez Perce warrior. More details on Killer Instinct’s 3.6 update, which include a host of balance changes, are available in the patch notes and in the video above.